Versatile Airline Gate Agent who consistently meets passenger needs while remaining up-to-date on related travel technology to further ensure customer satisfaction. Proficient at dealing with passenger concerns in often fast-paced environments. Focused on tracking passenger data dealing with complaints in a timely manner and efficiently performing a variety of duties. ¥ Scheduled flights and booked students for flight school classes. ¥ Ensured that all safety procedures were followed. ¥ Answered passenger inquires in person via phone and online. ¥ Scheduled appointments for private and corporate flights. ¥ Made arrangements for catered food for private clients. ¥ Performed light cleaning duties. ¥ Ensured the safety of flight crew airport staff and passengers. There are plenty of opportunities to land a Airline Gate Agent job position, but it won’t just be handed to you. 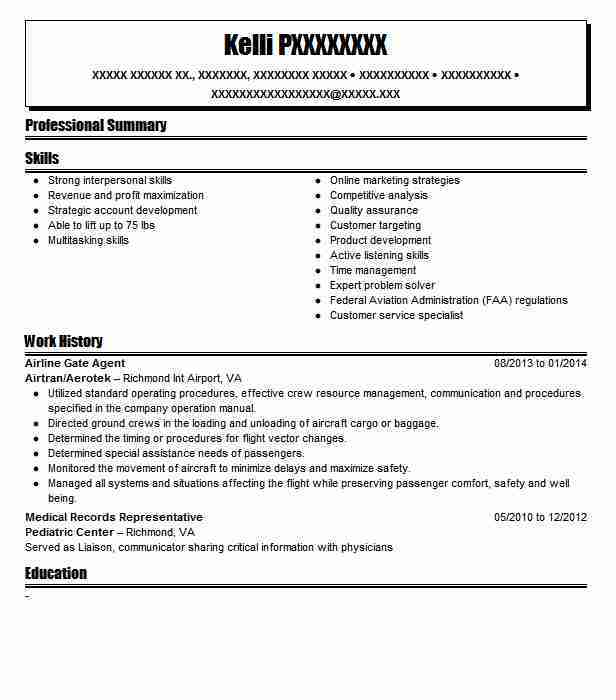 Crafting a Airline Gate Agent resume that catches the attention of hiring managers is paramount to getting the job, and LiveCareer is here to help you stand out from the competition.